Pinterest can be one of those awesome places or it can be just a wasted time sucker. Okay, so it can be both of those. In the interest of the former, there is also lots and lots of inspiration. I almost wish it would run on the tv screen without me sitting here so I could sew at the same time. It is like vegging on the couch for days watching HGTV while the messy dungeon of your house sits around you. Inspiration is not very useful unless you use it. Said in my most stern voice to myself more than anyone else. That being said, several European (?) clothiers have shown up on Pinterest lately and I am a fan! I will admit that the crossed over collar drives me crazy but other than that, I love this. This retailer also has a blog. Just gorgeous stuff. I love this ice blue with the soft grey and white. I know a soon to be young man that just may look quite handsome in this combination. This is a boy's romper. Not sure my daughter will let me put a bishop romper on a boy, but I can make this color scheme work for him. Now to get my hands on that sumptuous twill fabric. I adore this!! 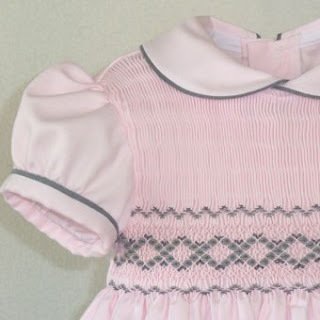 Love the "square" yoke design on the full smocked bodice. And those grey ribbons at the side. Breathtaking. I have always loved pink and grey together. I hope this little bit of inspiration got you to thinking about stitching faithful reader. I have been stitching along with a whole lot of cooking going around here. He needs face and whiskers but here is the first of 10 Peter Rabbits. I think they will like them. Not near as classic as the European garments but cute. I have a bishop, romper and jacket in the works. Back to it. And in case you missed it up there, our sweet new baby will be Blue! We are excited. Stay warm and keep stitching faithful reader. You should start everyone of your posts with the warning "Inspiration is not very useful unless you use it." I need to use my most stern voice on me. Can I help it if I just swoon over beauty? Have fun at Martha school! Those garments are gorgeous but the first thing I noticed was the cross over collar. Love your Peter Rabbit. That collar slapped me in the face, too! The little pink and gray is to die for. Thanks for sharing your inspiration. While I love the colors, that crossed over collar drive me nuts. Maybe if it were crossed over more it would look intentional, instead of just sloppy. Congratulations on the new baby doll! I love the blue and grey too. I just love the blue!! Beautiful shade! I know you will have fun stitching little boy things. You are smocking 10 Peters? do tell....what are the plans for the other 9? I love that plate and treasure it. I love the blue and grey. 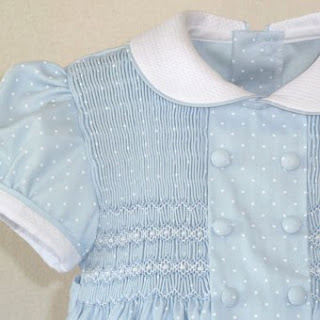 Doubtful bishop boy rompers are in my future as well. 9 Peter rabbits, industrious much? Cannot wait to see the finished project. I love that peter rabbit. 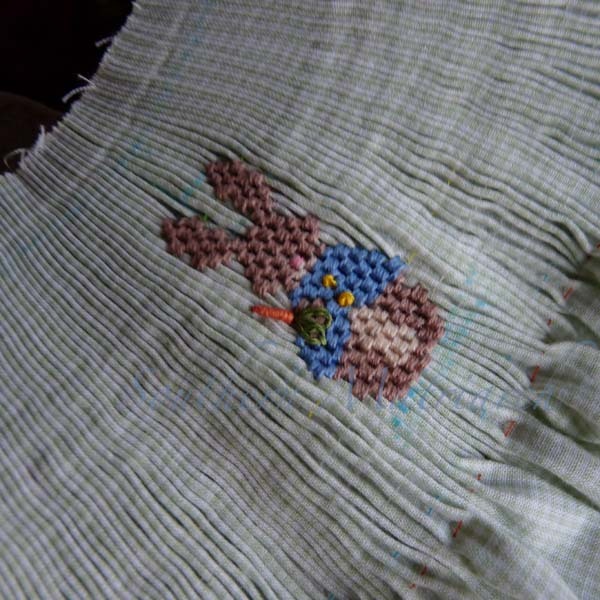 It may even get me doing some picture smocking again. 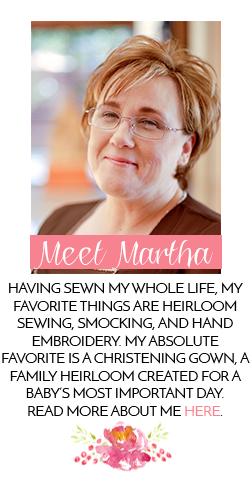 Martha, congrats on the new baby boy! 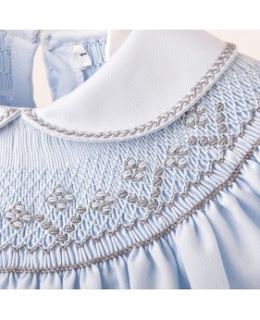 I love the blue especially the feather stitching on the collar. That pink is so sweet. I would never have thought to pair it with gray! and they carried it to the bottom in that shell hem.